Kiev’s security chief Andriy Parubiy has announced that Ukraine is drawing up plans to withdraw its soldiers and their families from Crimea. Andriy Parubiy said they wanted to move them “quickly and efficiently” to mainland Ukraine. 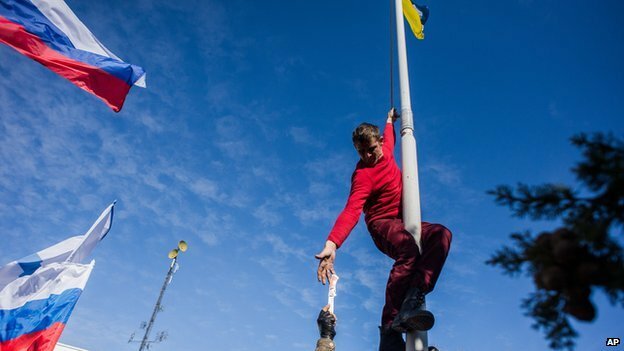 Earlier, pro-Russian forces seized two naval bases – including Ukraine navy’s headqurters – in Crimea. Kiev says its navy chief has been detained. A referendum in Crimea on Sunday, approving its split from Ukraine, came nearly a month after Kiev’s pro-Russian President Viktor Yanukovych was replaced by Western-leaning interim authorities. Andriy Parubiy, in a news conference, set out more details on Kiev’s position in light of the events in Crimea. And he said Kiev was seeking UN support to “proclaim Crimea a demilitarized zone”, which would involve the withdrawal of Russian troops and the “relocation of Ukrainian troops to continental Ukraine as well as facilitate evacuation of all the civilian population who are unwilling to remain on the occupied territory”. Ukraine is also leaving the Moscow-led Commonwealth of Independent States (CIS) alliance, and is preparing for military exercises with the US and the UK, Andriy Parubiy added. With reference to plans to withdraw troops and their families, Ukraine’s interim Foreign Minister Andriy Deshchytsya said that they would not be forced to leave if they did not want to. Meanwhile, a deadline of 21:00 local time set by Ukraine’s interim President Oleksandr Turchynov for the release of navy chief Serhiy Hayduk has passed. Oleksandr Turchynov earlier said that unless Serhiy Hayduk and “all the other hostages – both military and civilian ones – were released, the authorities would carry out an adequate response… of a technical and technological nature”. It is not clear exactly what he means, but it could involve the electricity or water that Ukraine supplies to Crimea. Kiev said Serhiy Hayduk was detained soon after Ukraine’s naval headquarters was stormed by some 200 pro-Russian activists, some armed, in Sevastopol – the port city which is also home to Russia’s Black Sea fleet. They were filmed going through offices, removing Ukrainian insignia and replacing Ukraine’s flag with the Russian tricolor. There were cheers from the crowd when Russia’s Black Sea Fleet commander Aleksandr Vitko arrived and entered the building. A handful of Ukrainian servicemen have refused to surrender. Ukraine’s navy base in Novo-Ozyorne in west Crimea was also infiltrated after a tractor was used to ram the front gates. Some 50 Ukrainian servicemen were seen filing out of the base. Ukrainian Defense Minister Ihor Tenyukh and First Deputy PM Vitaly Yarema reportedly tried to enter Crimea to defuse tensions but were prevented from doing so.